The Cyprus Department of Antiquities, Ministry of Transport, Communications and Works, announces that a fifth joint excavation campaign between the Universities of Ghent, Louvain and the Mediterranean Archaeological Society took place at Pyla-Kokkinokremos from the 27th of March until the 26th of May. The site of Pyla-Kokkinokremos represents a singularly short-lived settlement in the island’s Late Bronze Age history. Established only a generation or so prior to its eventual abandonment in the early 12th century BC, the site provides important evidence relating to the crucial period at the end of the 13th and the beginning of the 12th century BC. 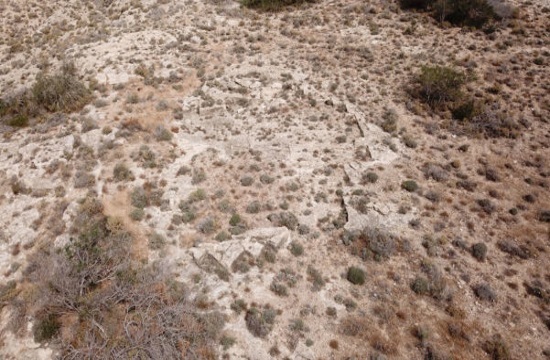 Former excavations suggest the entire plateau of ca. 7 ha to have been densely occupied. Excavated parts on the plateau were laid-out regularly within a perimeter ‘casemate’ wall. During the 2018 season excavations continued both on the west and east lobe in an effort to better discern the layout, organisation and functional specialisation of the settlement. Several rooms were partly or totally excavated in Sector 4. Their main characteristic is the great depth of deposit, in places up to 3 metres against the slope of the plateau. Specific stratigraphic details point to a natural disaster, possibly a seismic event, which led to the collapse of part of the plateau and the partial sealing of rooms built against it. The excavation of these rooms brought to light novel details suggesting a sudden and very quick departure of the inhabitants from the site, obviously in the face of acute danger. Therefore, in Room 8 ca. 100 loom weights, still unbaked and in the process of being made with raw strips of clay, were placed in a perishable container, possibly a basket with an oval shape, as their location on the bedrock suggests. The strips of clay were still malleable. It is the first time that such 12th century BC clay becomes available in considerable quantities, ideal for scientific investigation. Fragments of charcoal and burnt soil buried under the collapse of the plateau will provide important chronological details regarding the abandonment and partial destruction of some buildings. Further loom weights, fired this time, came to light in Rooms 15-16 suggesting the propable location of a loom. 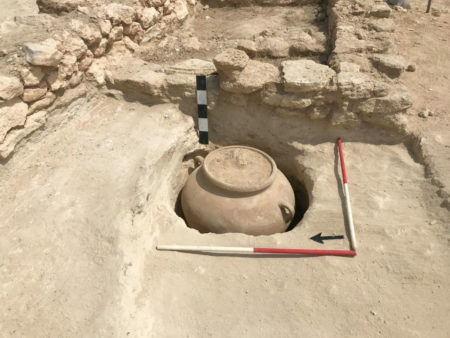 The excavation continued in the partly investigated Rooms 25 and 43-37bin Sector 4.1. It became evident that these rooms continue further to the east, towards the centre of the west lobe of the plateau. Five excavation seasons have resulted in the discovery of 34 spaces, built on three distinct terraces. 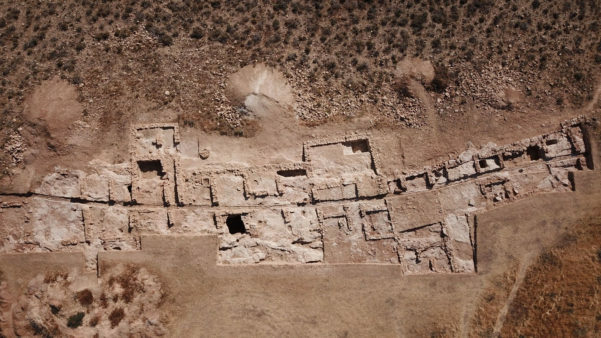 Spaces 21-34 were excavated during the 2018 campaign. The architecture within this sector is remarkably well preserved, especially against the slope. So far, the remains of Sector 5 show no signs of a clear north-south external façade suggesting the presence of a casemate wall. Spaces 5.26 and 5.28 each seem to have held an outer (settlement) entrance which appears to have been closed off at some point in time. If so, the rock-cut shafts adjacent to the entrance in both these rooms might have belonged to a later phase, since they would not fit within the context of an entrance. Another major element in Space 5.26 is a large, well-cut, trapezoid ashlar block. Space 5.31 generated an ensemble of finds, namely three dozen chunks of ore neatly stacked within a rectangular surface alongside a complete pithos, a stone hammer and a ca. 2,5 kilo heavy lead block – denoting the use of this room as part of a metal workshop. Assemblages of bronze objects were unearthed in Spaces 5.2 (excavated in 2014) and 5.21. The latter yielded a concentration of more than 100 bronze fragments as well as a sickle, an arrowhead and earrings; presumably all these bronze objects had been collected in a vessel. Some other significant finds are a large stone tripod mortar or vessel (Space 5.25) and a bronze arrowhead, probably intentionally deposited within a crack in the bedrock floor (Space 5.28). During the topographical survey of the Kokkinokremos hill a large, hitherto non-published limestone quarry was discovered (Fig. 3). Located immediately below the west lobe of the plateau on which the Late Bronze Age settlement is situated (Sector 4), the quarry extents over ca. 500 metres², with a width of 40 metres and a length between 15 to 24 metres. The exploitation, either by chisels or stone picks, is illustrated by the usual extraction channels (ca. 8 to 10 cm wide) in the rock along with several, unfinished regular blocks. No surface sherds were observed, hence further study is necessary to decide whether the quarry already dates to the Bronze Age or to the historical period occupation that is attested in the proximity. This said, several ashlar blocks were also noted on the surface of the Bronze Age site and some were either found reused in the walls or used as lintels.